Why are there two versions of Blue SWAT's opening theme song TRUE DREAM? The first time TRUE DREAM was released on CD was the 20th of March in 1994. The CD Single itself was as bog-standard as most Forte releases were. 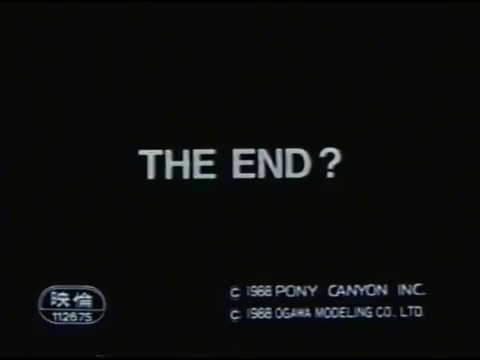 It featured the opening and ending theme songs and that's it--no Karaoke versions. TRUE DREAM sounded just as it did in the series. The version released later on for the Blue SWAT Music Collection was just a shortened TV size version of the same song from the CD Single. Here's where things get a little bit murky for me as I do not own a copy of the 1994 Blue SWAT Song Collection. On the 17th of May in 2004 the third volume of the Metal Hero Super Hero Chronicle was released. On it was a version of TRUE DREAM that was completely different from both the CD Single and TV Size version. Not only was there a heavy use of reverb throughout the entire song, but the lyrics were completely re-sung by Tatsuya Maeda. There are a couple of clear differences in inflection of certain lyrics. Was this an outtake that somehow survived and managed to get a release years later? I'm not so sure about that. If it was a case of just the lyrics being sung a little bit differently, I would probably write this off as an outtake. The music being somewhat more polished in the Super Hero Chronicle version just throws everything for a loop. Intro: There is much more build-up in the SHC version over the single version. Lyrics: Sung differently in a few parts, use of reverb in the SHC version. Guitar section: Stronger use of percussion. So I guess the real way to differentiate the two is that previous versions are the Forte Version with the latter being the Columbia Version. Technically incorrect (since the Karaoke version on Toei Metal Hero Karaoke Vol.2 features the Forte version despite being a Columbia release), but I'm all for simplicity. I hope you enjoy the video I put together. Thanks once again for supporting my blog for the past five years. This extra blog came about because I realized that I posted five blogs in January 2011 plus, well, it's five years. So why not go the extra mile and make it five? Regularly scheduled programming resumes in February. I have a doozy of a CD Collection post coming up mid-Feb.--one I actually get requests for. I've been teasing this one for awhile. The clues that I gave out were that it was a Tokusatsu movie with the word "Star" in the title (specifically "Star ______") and that it was two words. I also gave out little clues that the soundtrack featured a song by a legendary singer. There were a few more clues that I could have given such as the same legendary singer also had a role in the movie...or that the film had it's own video game adaptation for the MSX2. I really wanted to keep this one a secret until it posted. So here it is.....Star Virgin. Where the hell do I begin on this one? 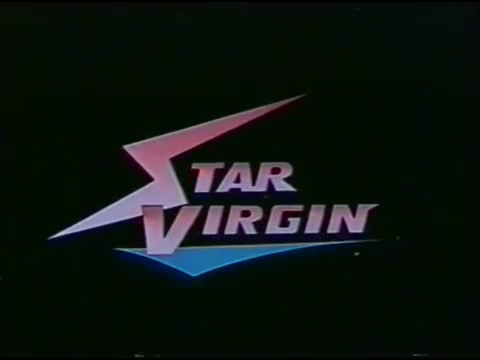 Star Virgin is a 1988 direct-to-video Tokusatsu film produced by Pony Canyon of all companies. It largely capitalizes on the Bikini Armor genre, which I'm really not familiar with.....nor do I intend to become familiar with. 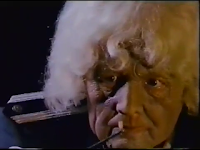 Clocking in at just under an hour it features a fairly basic plot wrapped around special effects of varying skill. It's most notable achievement is casting anisong megastar Isao Sasaki. 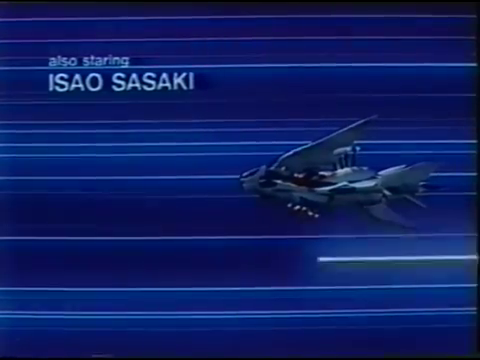 Yes, THAT Isao Sasaki. 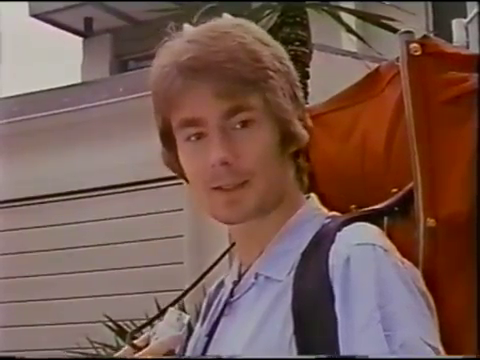 He was in this film! The film begins with our heroine, Eiko, having been tied to a cross (classic Tokusatsu). The monster who trapped her begins acting somewhat inappropriate with her while she is trapped. This causes her bracelet to activate which transforms her into Star Virgin. She makes short work of the monster and turns back to normal. It is then explained that she is embarking on a vacation to Earth and that it was her father who fit her with the transformation bracelet that would activate whenever a man would act lecherous toward her directly (or in her vicinity). 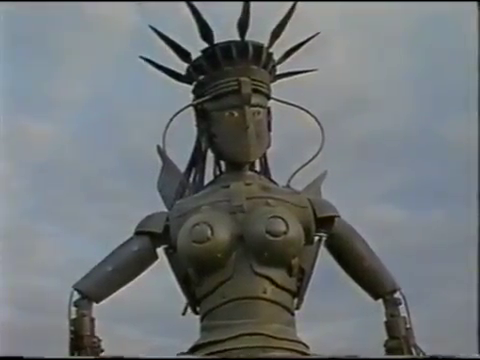 On Earth, she runs into a young man named Ko who is the sudden target of a tank following a dental implant surgery. In order to transform and fight the tank, she tricks a foreign tourist into being inappropriate with her. 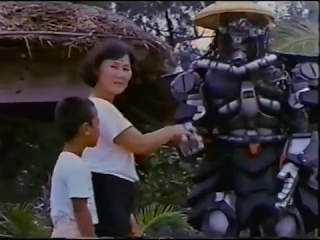 She manages to transform, destroy the tank, and escape with Ko. 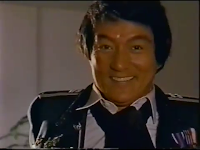 Ko is kidnapped by Colonel Arashiyama, who has been after Ko's mysterious tooth implant to restart the nuclear reactor on his island and dominate the world. Eiko manages to break into Arashiyama's layer and free Ko. Arashiyama deploys his robot, Tsutenkaku 1, to follow the pair. Naturally Eiko becomes Star Virgin thanks to Arashiyama's advances. Arashiyama deploys Tanegashima shi-shiki Robot, which is a giant robot formed from a large white copy of the Statue of Liberty. 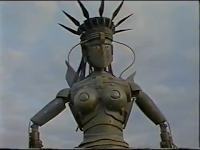 The robot shoots flames at Ko and then manages to get Star Virgin in it's grasp. After shocking Star Virgin for some time, Ko manages to get into Arashiyama's fighter jet and blast the robot until it frees it's grip on Star Virgin. Meanwhile, Arashiyama is successful in restarting his reactor with Ko's tooth implant. Star Virgin uses her grappling hook to join Ko in the jet. 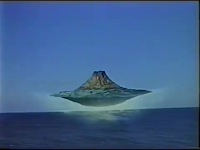 They then fly into the entrance to the core of the island. 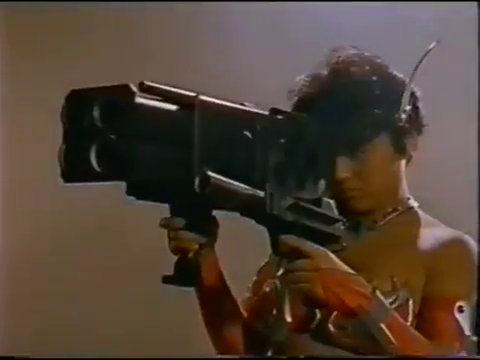 They launch an all-out attack using the plane's machine guns as well as a handheld bazooka. Ko's tooth is freed from the reactor which then begins to explode. They manage to escape the island as it explodes. En route back to land, the fighter jet begins to fail, which forces them to abandon the plane and jump into the water. Somehow they managed to find a canoe, which they use to make their way back to land. Tsutenkaku 1 reaches up from underwater and knocks both of them out of the boat, forcing both of them to swim to land. Tsutenkaku 1 also swims to land, but is greeted by a group of children playing on the beach. 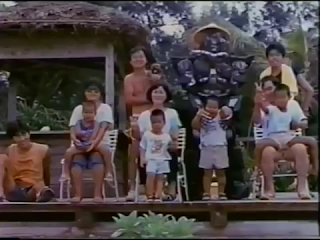 He starts to malfunction and becomes friendly with the children and their families. 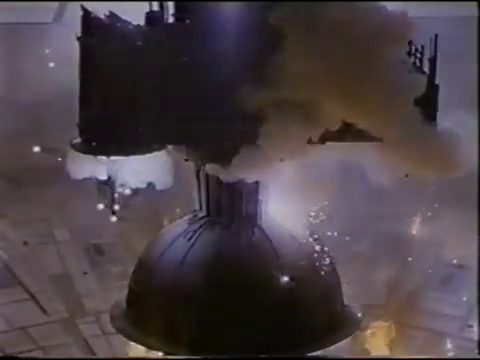 Arashiyama, his henchmen, and Tanegashima shi-shiki are all shown to have survived the blast. As the credits roll, Eiko and Ko enjoy the rest of the day at the beach. 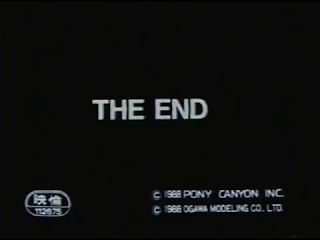 Just as the credits end and "The End" splashes on screen we hear Eiko and Ko getting attacked once again after hearing some metallic footsteps. Wow. OK, so if I'm going to start somewhere, it's going to be the Star Virgin powers. We have a woman (yes, you can feel less skeevy--actress Eiko Kuroki was 18 at the time) whose powers come from men being outwardly perverted toward her. I...wish I was making this up. She had to trick a white dude into making a move on her so that she could transform. Her father probably owes that dude an apology. Like, It's one of the more bizarre superhero premises ever...but at the same time it makes sense. Her father didn't intend for her to be a heroine of any kind. 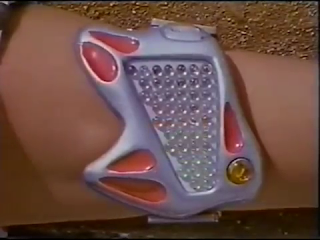 He just fitted her with the bracelet (which is kinda like an inverted Ultraman timer) to protect her from creeps while she was on her trip to Earth. She kinda fell backwards into this whole situation as much as Ko did. 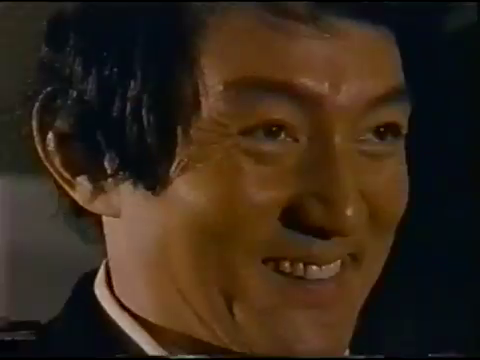 Isao Sasaki being cast as the villain of the movie was a solid casting choice. He wore the heavy make-up they plastered on him well. 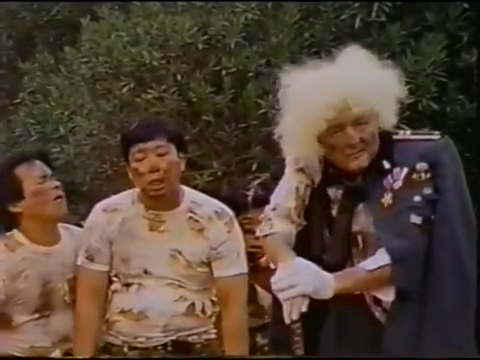 It was a pretty rediculous get-up, but it just kinda worked BECAUSE it was Sasaki. His voice sealed the deal on the whole thing. From there, the acting kinda went downward. To their credit, everyone looked like they were having fun--and they likely knew this was going to be a video release. Sasaki is just acting his heart out, though. 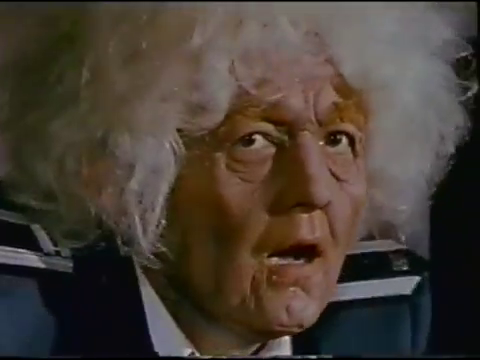 The effects of the movie were, like the acting, all over the place. 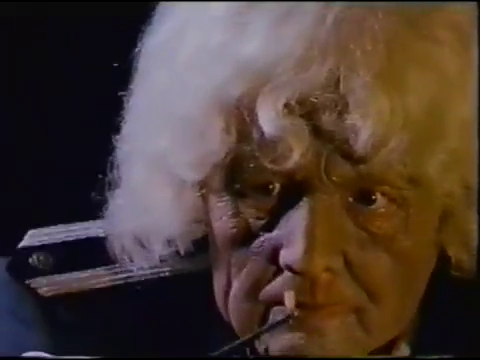 Some of the effects were borderline impressive, while others were pretty silly. I enjoy model work, and this film is full of it, but they could have either lowered their aspirations or tried a little bit harder to get some effect shots peppered into the shots using models. 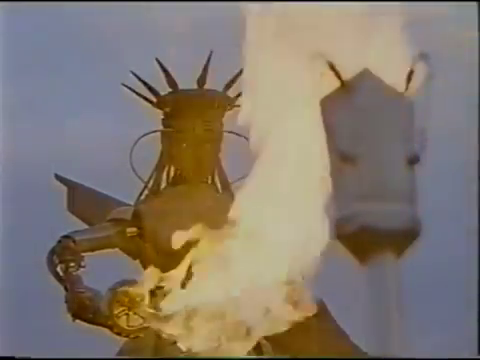 BUT.....if I had a Statue of Liberty mecha I would probably put it in my movie as much as possible as well. I'd be lying if I said I didn't enjoy this film. I might be a sucker for the bizarre, but I'm sure anyone will enjoy watching this one. It's entertaining and short enough that you won't feel robbed if you're not totally sold on it. I should say that even with the perverted source of Star Virgin's powers, the movie itself is very tame. Once you get past that and the fact that she spends a good portion of the movie in a bikini'd chastity belt, it's a fairly vanilla movie. Give it a shot. It might be a little bit all over the place and not have much of a plot or character development, but it's definitely entertaining. The Star Virgin original soundtrack is probably how I first learned about this movie. In my normal rounds I managed to find this CD for sale some time ago. Just from the photos I knew that this movie was probably worth checking out. I mean Isao Sasaki was dressed up as an old clownish looking dude! How could I go wrong? Well, I ended up buying the CD for my collection and checking out the movie not too long afterward. This soundtrack, while short, is probably too good for this movie. As I mentioned before, there is a song by Isao Sasaki as well as two songs by Reiko Iwama and a lone song by Star Virgin herself Eiko Kuroki. 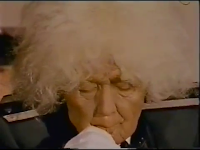 The music was composed by Kenji Kawai who is an insanely prolific composer. 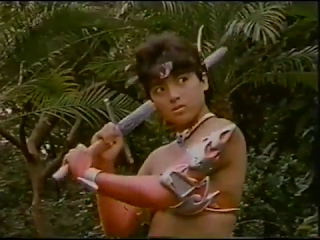 I know him primarily for his work on Ranma 1/2 and Kyatto Ninden Teyandee (I'll probably get to this one someday). My readers will probably know his work from Ultraman Nexus and both series of Akibaranger. I recommend taking a look at the list of work he's done over the years--it's staggering. I suppose the best way to break this CD down is by songs and then by music collection. Of the fourteen total tracks, four are vocal songs. 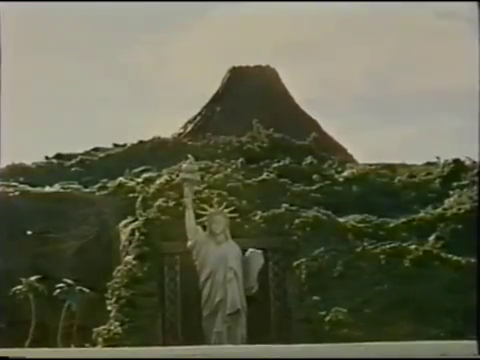 The theme song, Star Virgin is by Reiko Iwama as well as an image song called Namida no kokoro. I loooooooove the theme song. It's insanely catchy--easily my favorite of the four. It has a nice energy and features some really good singing. Namida no kokoro doesn't get used in the film. It's not a bad song, I just don't think there was any room for it. 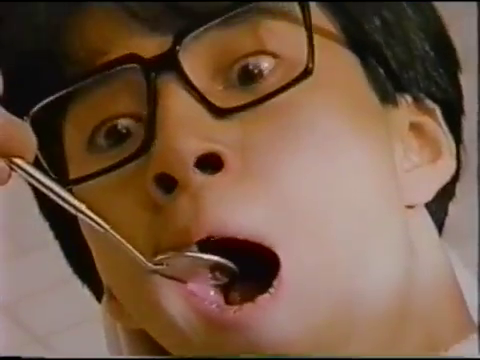 Isao Sasaki's song, NONSTOP DREAMER, does make it into the film toward the end. It has the sound of an 80s anime bad guy's theme song. While a little on the cartoonish side, it is a great song as you would imagine. Has Isao Sasaki ever disappointed? Ever? The last vocal song, and I saved this one for last for one reason, is the character song by Eiko Kuroki. The title? H ga watashi no Energy or H is my energy. Now THAT is a song title right there. I'm sure you can figure out what the "H" stands for. The song itself is kinda upbeat and cheesy. Not bad, but certainly not great. The music collection is quite solid. I meant it when I said it was too good for this movie. It sounds like it could be from the mid 90s most of the time. I'm actually quite impressed that this movie had such a great music collection and managed to under-utilize it the way it did. As this disc is only 32 minutes long, it only contains about 17 minutes of music. It's all great, though. There was a full band involved when it could have easily just been a guy with a synthesizer. As this is an early CD it comes in a very thick plastic case. It's hard to describe unless you've dealt with an old CD case, but they have quite a bit of heft to them...and don't crack nearly as easy. To save costs, the booklet wasn't printed into the jacket. Since this was getting a simultaneous LP release it just has the fold-out wedged inside the jacket. The upside is that I now have a bitchin' Star Virgin poster. The downside.....there is none! Did you hear me? I have a Star Virgin poster! I should also mention that there were also 8cm CD and 45 singles released containing the theme song as well as Namida no kokoro. I don't own the CD single...but I'm keeping my eyes peeled! I need to complete my Tokusatsu 8cm collection! As this film nears it's 30th anniversary it's hard to say if it left any kind of lasting impression on Tokusatsu fans. I've been giving my hints on Twitter for some time, but nobody managed to guess it correctly. It's kind of a shame that nobody seems to know this one...but at the same time it can only be appreciated by a goofball like me. 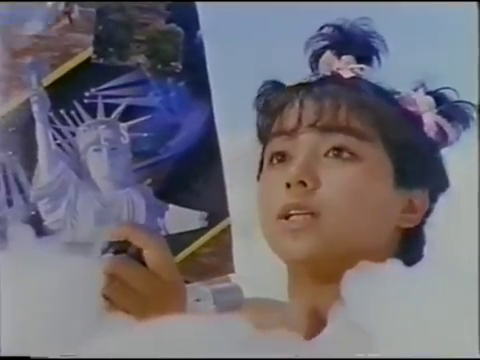 I can't imagine someone finishing an episode of Kamen Motorist Drive and being like "Hmmm Star Virgin? Let's give it a watch!". It's certainly worth a viewing if you happen to have a copy on VHS, Beta, or Laserdisc (no DVD......surprised????). It's also on Youtube, but you'll have a good time trying to cobble together the entire movie over a couple of accounts. Hahaa. Thank you for reading my blog on this forgotten movie and for supporting my blog for the past five years. This is the final post for my five-year anniversary month. While it was a ton of work for me to double my output, it was all worth it. I mean it. Thank you for reading. Thank you for spreading the word. Thank you thank you!